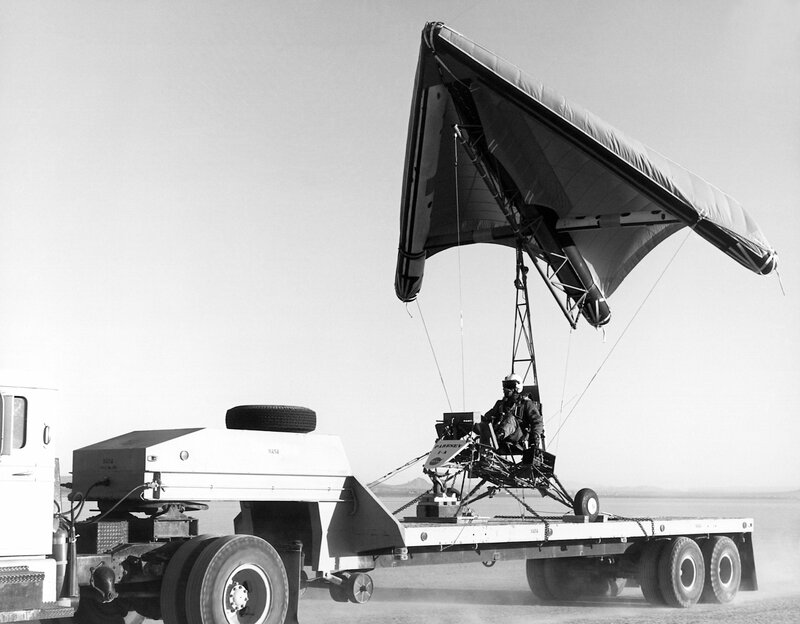 From the multiple proposed land landing systems, NASA chose the Rogallo wing – a paraglider-style inflatable wing that would deploy from the ballistic spacecraft during descent to turn it into a glider. The system would give the pilot considerable directional control, and a land landing would spare him from the dangers associated with a splashdown. It would also cut down on NASA’s reliance on the Navy for recovery of its astronauts. Gemini never used the Rogallo wing despite considerable time and money spent developing the system. Development began in 1961 before the system was cut from Gemini in 1964. In the intervening three years, however, the system was sufficiently promising that the astronauts had to learn to fly it. 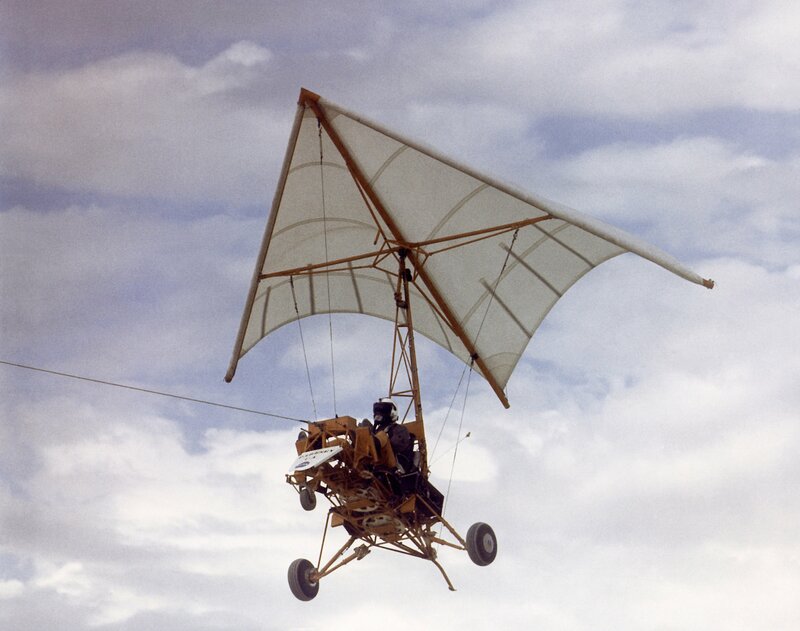 Thus was born the paraglider research vehicle or Paresev – built by pilots, for pilots, literally in their own back yard. In the early 1960s, X-15 pilot Milton Thompson (left in 1960) was working at NASA’s Flight Research Centre at Edward’s Air Force Base on the follow-up program to the X-15 –the X-20 or Dynasoar, short for Dynamic Soaring. Dynasoar was a lifting body vehicle – a vehicle that generated sufficient lift by virtue of its design to allow a pilot to land it like a glider. This landing profile is more simply known as lifting reentry. The Dynasoar program built on the basic concept of spaceflight proved by the X-15; the X-15 was too small to achieve orbital altitudes. The vehicle was launched into orbit on top of a rocket. After orbiting the Earth, it would reenter the atmosphere using retrorockets just like the Mercury capsule. But instead of falling to Earth, the pilot would fly it to a smooth landing on a runway. Dynasoar never got past the preliminary stages, but its echo is clearly seen in the Space Shuttle developed in the post-Apollo years. 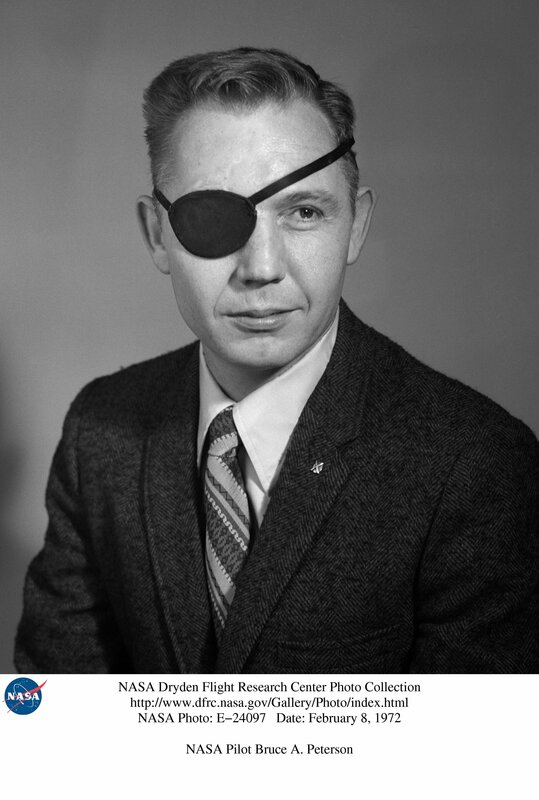 While steeped in concepts of lifting reentry in 1961, Thompson attended a talk from Francis Rogallo on his paraglider wing that had the potential to turn the Gemini capsule into a glider. Thompson was impressed. His work on Dynasoar had convinced him lifting reentry was the way forward in space, but knew NASA would never commit to lifting bodies while the method remained too heavy for its current launch vehicles and too expensive. He asked FRC Director Paul Bikle for approval to develop a test vehicle NASA could use to gather supplemental data on the Rogallo wing’s flight properties. Thompsons request was denied; Bikle argued the FRC was too busy with the X-15 to take on another test flight program. 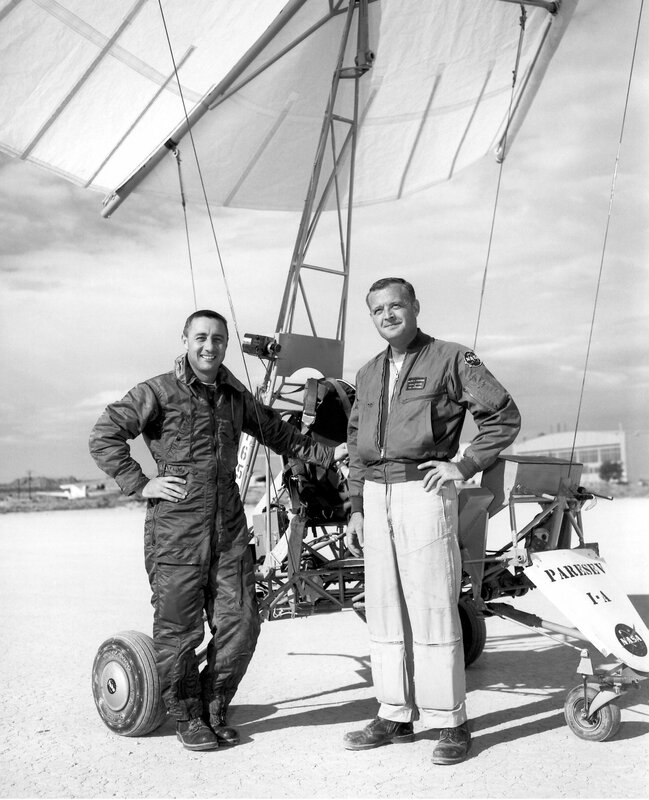 Undeterred, Thompson proposed to fellow X-15 pilot Neil Armstrong that they build a paraglider test vehicle on their own. The two reasoned that the astronauts would have to learn to pilot the Rogallo wing somehow; they might as well be the ones to build the test vehicle. When word of this side project reached Bikle he relented and instituted a formal paraglider research vehicle program at the FRC. Thompson believe this change of heart was Bikle’s attempt to save he and Armstrong from dying at the hands of their own shoddy research vehicle. Flying the Paresev simulated the method of control for the Gemini-Rogallo configuration. The wing pivoted on a mast, controlled by the pilot (who was fully exposed to the elements in his seat) with an overhead control stick. Pitching the sail forwards and backwards generated or decreased lift, and altering the angle of the sail yielded directional control. Like Gemini-Rogallo, the focus was on shifting the vehicle’s centre of gravity. Once finished, Bikle had the Federal Aviation Administration verify that the vehicle was flightworthy. It was, even though Thompson, Armstrong, and the others who had built it still had their doubts. It was a certainly a difficult vehicle to fly that required good instincts. It had no power, little instrumentation, and no escape system save the pilot’s own parachute. 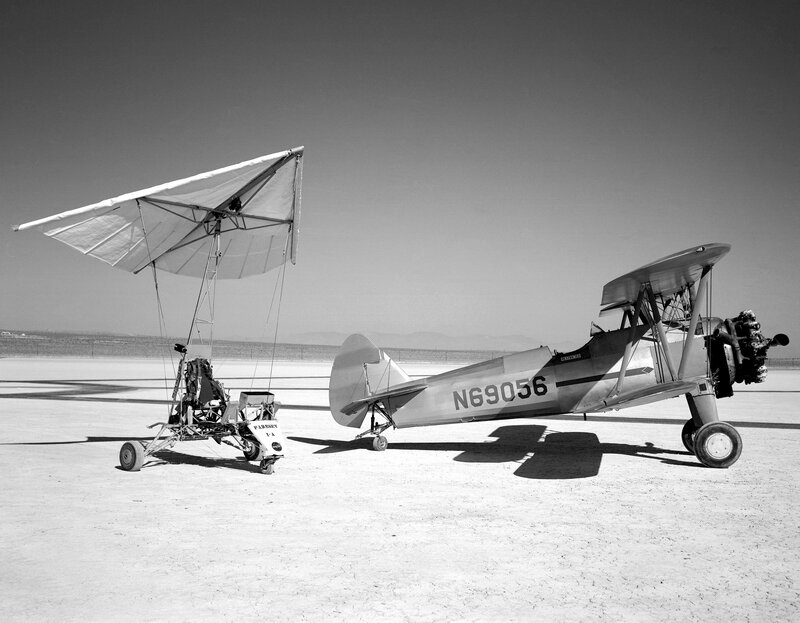 These low-altitude ground-tow tests proved the viability of the Rogallo wing as a landing system. They also proved the Paresev was flight worthy and controllable, even though Thompson equated its sluggishness to the feeling of controlling an aircraft with a wet noodle. With successful ground-tow tests under his belt, Thompson proceeded to the more difficult and dangerous air-tow tests. The Paresev team had determined that to get a real sense of the vehicle’s controllability in landing, the Paresev would have to begin its free flight from 5,000 feet. Getting the Paresev to this altitude was a delicate business. The tow plane would have to fly in a circular direction to keep the Paresev over the lakebed. In the event the pilot was forced to sever the towline and land ahead of schedule, he would need a safe landing zone – landing in sand dunes was less than ideal. Another challenge was gathering data during these free flights, particularly the rate of descent. The Paresev’s instrumentation was limited by its not having a source of power. The pilot’s control panel had an altimeter and air speed indicator, two instruments that don’t require power to work. During the flight, the pilot would call out his altitude and airspeed at regular intervals. These recorded positions were matched with photographs taken from the ground at the same intervals. Between the two data sources, engineers were able to plot the Paresev’s flight path. The flight up to 5,000 feet was a difficult half hour flight. Each time the plane turned the 1,000-foot towline slackened and Thompson’s airspeed decreased. The Paresev also proved to be unstable in towing conditions. Once at altitude, Thompson severed the towline and found the Paresev to be instantly more responsive. It was still difficult to control, taking a lot of effort and strength, but he manoeuvred the homemade vehicle to a soft landing on the lakebed. The mood was celebratory when Thompson landed. Observers on the ground were thrilled at the smooth flight, especially for a first free flight test. Bikle was particularly pleased, so much so that he convinced an exhausted Thompson to make a second flight right away. The second flight duplicated the success of the first, but was far more taxing on the pilot. Thompson had to wrap his legs around the control stick to take the strain off his arms. Once on the ground, he ordered the Paresev taken into storage for the night lest he get carried away and agree to a third flight. The Paresev program continued with great success in the months following the initial flights. Like any test program, however, there were a fair number of failures as well. Peterson was lost in a cloud of dust. He’d fallen no more than 10 feet, but the impact devastated the vehicle. Its nose was destroyed, the wing severed from the body, the landing gear was gone, and pieces were scattered around the impact point. Those first at the scene found Peterson still strapped in his seat with a bloody hand held over his abdomen. The cause of the crash was unclear, but strong control forces were thought to have overpowered the pilot. The good news was that Peterson’s injuries were superficial. The blood was from a cut on his hand and the pain in his abdomen was a bruise. He was released after a day in the hospital. The crash necessitated building a new Paresev, the Paresev 1A. The upside was that this gave engineers a chance to work some fundamental changes into the design. 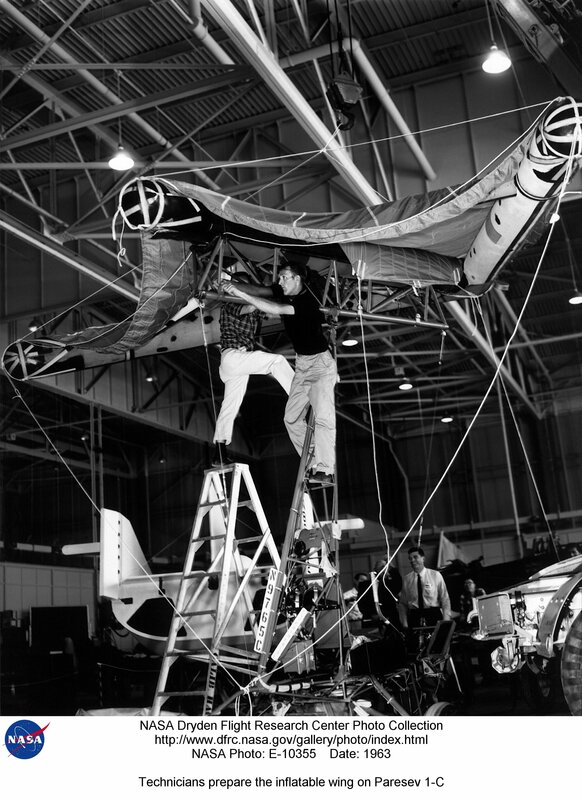 The control system was modified to allow the pilot to control the sail with a series of cables that also acted as a backup connection between the wing and the body of the vehicle. This proved to be a far superior control method; the new Paresev was far more responsive than its predecessor. More innocuous problems surfaced as well. During one flight, the needle fell off the air speed indicator. Thompson landed still tethered to the tow plane to have a sense of his airspeed. At one point, an engineer suggested the pilot deploy a smoke bomb to make the Paresev more visible in photographs. Milton Thompson tested the smoke bomb. Upon detonation, the Paresev was engulfed in an acrid cloud. Thompson landed safely despite having poor visibility. It was the only time the smoke bomb was used. By September 1962, the Paresev was becoming reliable enough that other pilots began making test flights – roughly six months after his disastrous first flight, Bruce Peterson hadn’t yet returned to the Paresev program. Thompson’s co-conspirator in building the Paresev in the first place was the first new pilot to fly. 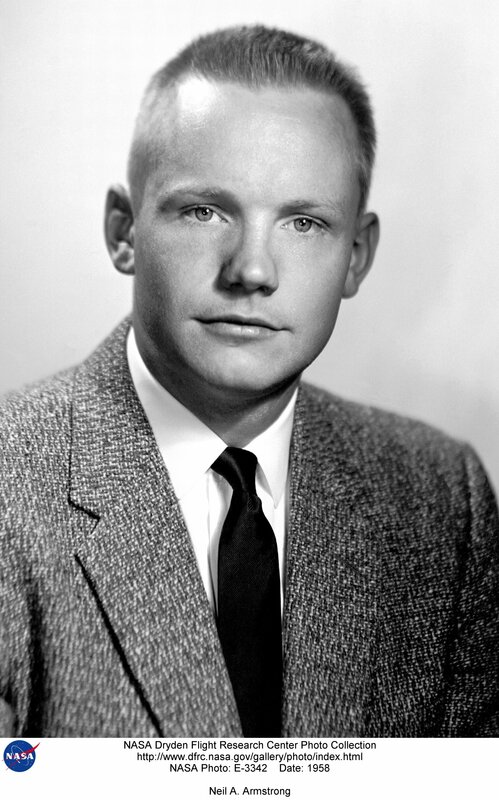 Neil Armstrong had just joined NASA as one of the nine new astronauts, and he was likely one of the men who would land a Gemini mission with the Rogallo wing. With NASA’s approval (lest their latest import be damaged), Armstrong flew successful ground and air tow tests, landing without incident on the runway. Many repairs later, the new vehicle was dubbed the Paresev 1B. Grissom returned to Edwards to pilot the new model and immediately took it up on an air tow test to land safely from 7,000 feet. This broke Thompson’s record of a safe landing from 6,000 feet. Grissom’s record remains unbroken. 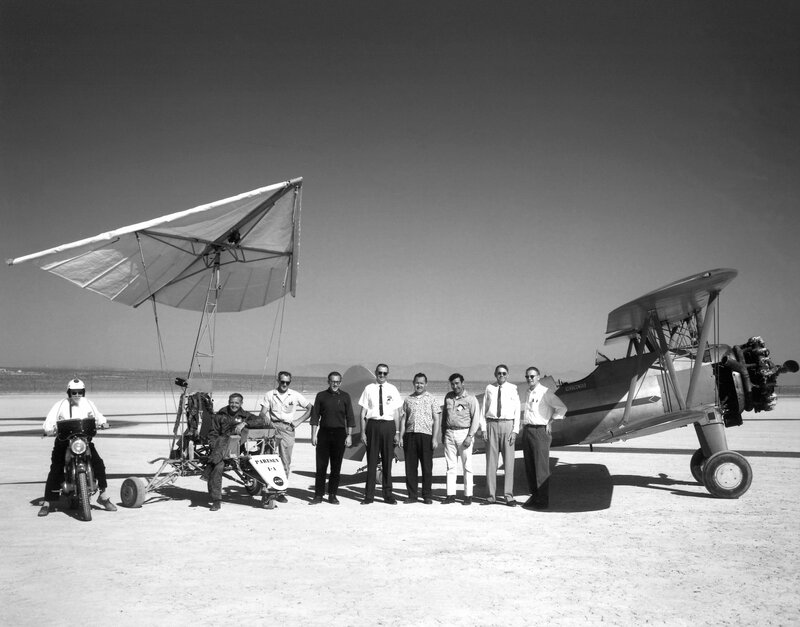 In January 1963, the Paresev program was turned over from Thompson as the principle pilot to Peterson. It was a year old, had flown over 50 air tow tests, and been rebuilt countless times. 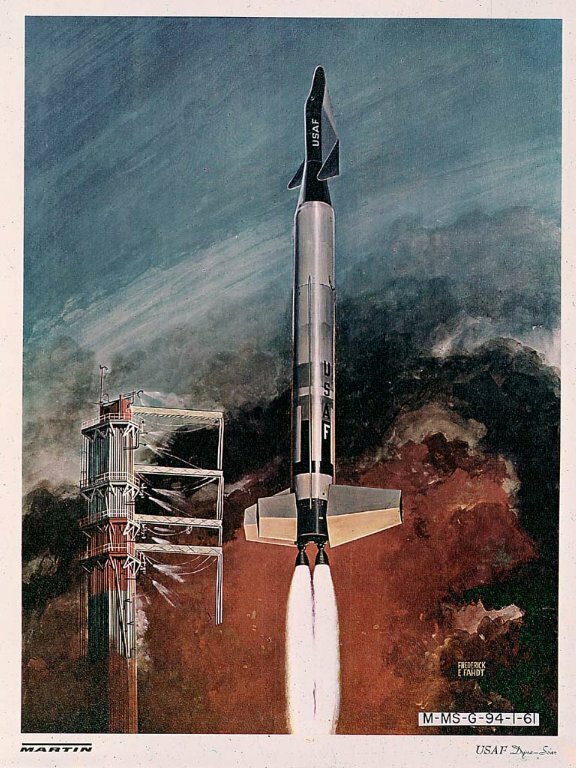 Under Peterson’s direction, the program began answering some of the larger questions facing the Rogallo wing’s development with respect to the Gemini program. One of the main questions was how to test the Gemini-Rogallo configuration – it would have to fall freely from altitude with the wing already deployed for a true test of its manoeuvrability. A helicopter was the obvious tow vehicle; it was the only vehicle that could lift a spacecraft that couldn’t take off. Peterson himself worked out the details of this proposed flight profile in the Paresev, successfully landing the vehicle still tethered to the helicopter. He didn’t take the test any further with a free flight. There was no point. The Paresev couldn’t simulate the reaction of the Rogallo wing on a Gemini spacecraft when dropped from a copter. The vehicles might fly the same way, but they wouldn’t fall the same; one was a solid metal container, the other a lightweight frame. Peterson’s first ground tow test using the inflatable wing ended in a spectacular crash. He determined that the inflatable wing created stronger forces than the sail against which the astronaut had to push to gain control. Foot pedals was consequently added to take the strain off the pilot’s arms. Peterson flew successful ground and air tow tests in the modified Paresev 1C in March of 1963. The failure of the Rogallo wing forced Milton Thompson to concede that paragliders were no substitute for lifting bodies. As far as he was concerned, the Soviets had the best land landing system – a parachute-controlled descent was reliable if crude. In total, the Paresev made 341 flights in almost two and a half years. Seven pilots flew the vehicle. 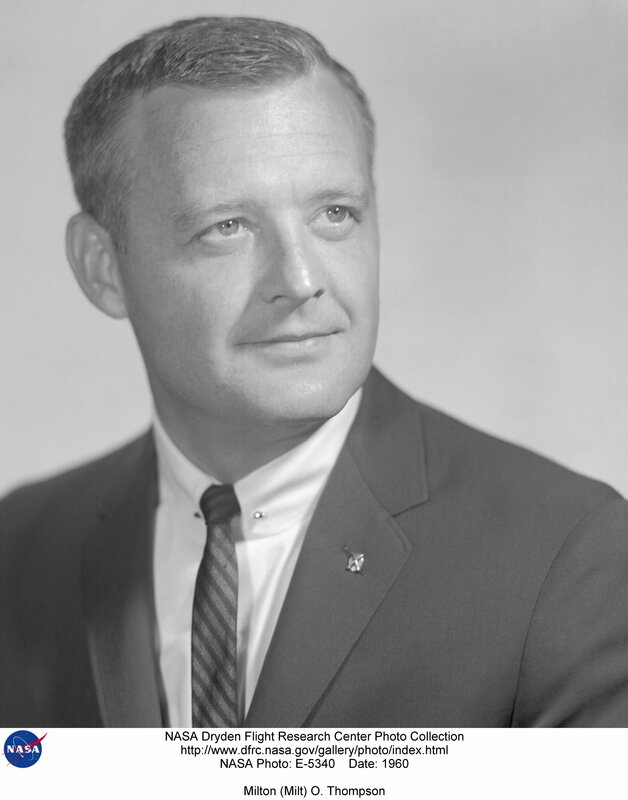 In addition to Thompson, Peters, Armstrong, and Grissom were Langley research pilot Bob Champine, FRC pilot from the Army Emil Kleuver, and the NAA pilot who was the only pilot to fly a Gemini-Rogallo configuration, Charles Hetzel. 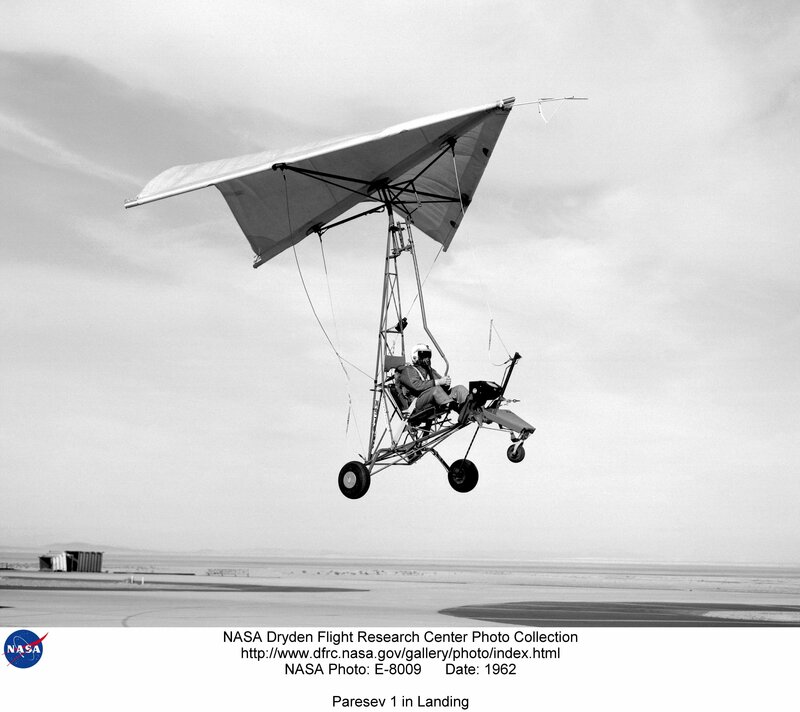 The program proved that a wing sail design was a viable way to pilot a spacecraft to a smooth land landing. But it also demonstrated that the theory of the paraglider was easier in theory than in practise; the same conclusion that killed the Rogallo wing from Gemini. Milton Thompson in the Paresev 1A with its tow plane the 450-hp Stearman Sport Biplane. He is pictured with the flight crew. Starting at the left: On the motorcycle is Walter Whiteside, Frank Fedor, Richard Klein, project manager Victor Horton, Tom Kelly, Jr., Fred Harris, owner of the Stearman John Orahood, and Gary Layton. 1. Milton Thompson, Flying Without Wings: NASA Lifting Bodies and the Birth of the Space Shuttle. Smithsonian Inst. Press. 1999. 2. Milton Thompson, At the Edge of Space: the X-15 Flight Program. Smithsonian Inst. Press. 1992. 3. David Shayler, Gemini, Steps to the Moon. Springer Verlag. 2001. 4. 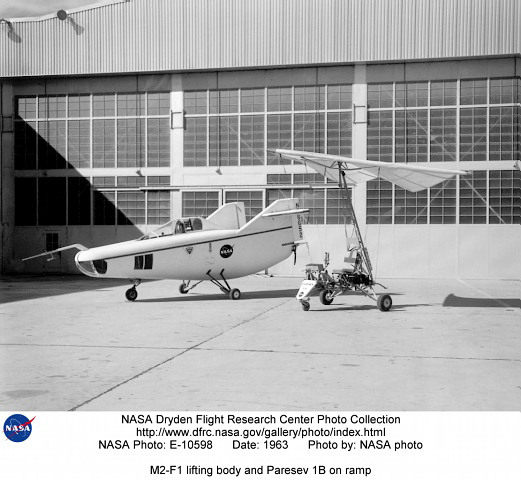 The Dryden Flight Research Centre has a great page dedicated to the Paresev. The centre’s photo collection can be found here, and its movie collection, here. Wow – thankls for the interesting story – I’d never heard of this before. Well that’s just the most unwieldy ultralight trike I’ve ever seen. Pioneers they were though!